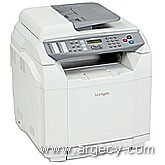 The Lexmark X502n offers high quality and multifunction performance, plus the added benefit of advanced faxing. Among many of its features, it boasts rapid transmission speeds to send off your faxes in as little as three seconds. Packaged Size (" - H x W x D) 29.9 x 23.4 x 22.6 "
Size (" - H x W x D) 21.0 x 19.0 x 17.2 "
Packaged Weight (lbs) 94.6 lbs.